Throughout the western United States, the Whitebark Pine is dying. Impacts reach to human populations as well. Mature and healthy trees create shade in high-altitude regions, slowing snow melt and thus providing water supply for a longer period of time. The tree is being assaulted on several fronts. For over a century, whitebark pine has been blighted by blister rust, a fungus that originated in Europe. Adding to that is the fire management regimen of the U.S. Forest Service. Fire is an essential element of the forest ecosystem, and the fire suppression practices of the past hundred years has allowed other species like fir to thrive and compete with the more fire-tolerant whitebark where before the competing fir was kept in check by naturally-occuring low-intesity fires. And now comes the mountain pine beetle, eating their way through huge swaths of trees, “killing them by the thousands”, as they march to ever higher altitudes due to warming temperatures over the past few years. The sudden “invasion” of the beetle leaves the already stressed pine defenseless to their destruction. As a result of the triple threat and dire state of the whitebark pine, and the essential role it plays in its ecosystem, the NRDC has filed a petition to have the tree added to the federal Endangered Species List. 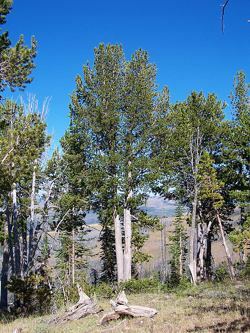 If the petition is granted, the whitebark pine will be the first wide-ranging tree species to be added to the list. What if the Whitebark Pine Becomes Endangered? …the most important thing we can do for the tree is to get a grip on global warming pollution.” Mitigating global warming will lower temperatures in the tree’s range, the only protection it has from the mountain pine beetle, which in turn strengthens the entire ecosystem. “Getting a grip on global warming pollution” is not likely to happen, even with an ESA listing, at least under the tenure of Interior Secretary Dirk Kempthorne, who has made it clear that the ESA can’t be used to mitigate global warming. Can George Bush and his minions get out of Washington soon enough? Perhaps – though Bush has already done his best to render the Endangered Species Act as meaningless. The petition period for the whitebark pine spans the presidential period. It will ultimately be the Obama administration and incoming Interior Secretary Ken Salazar who decides on the fate of the tree.